Among the great variety of locations a couple might consider as their wedding venue, a sewage treatment plant probably would not rank highly. Yet weddings are happening at the Brightwater Treatment Plant near Maltby, Washington. 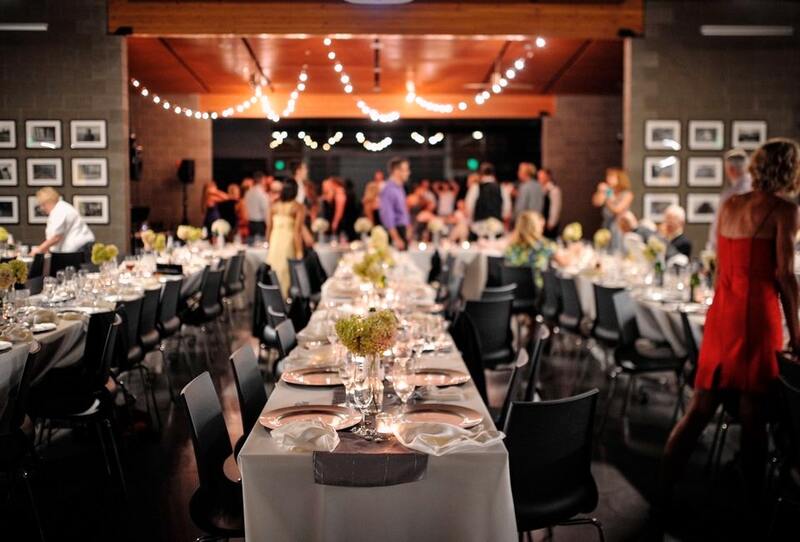 To be precise, couples are booking the Brightwater Education and Community Center for their nuptials. Two dozen couples have tied the knot within the center’s striking contemporary architecture since 2014. 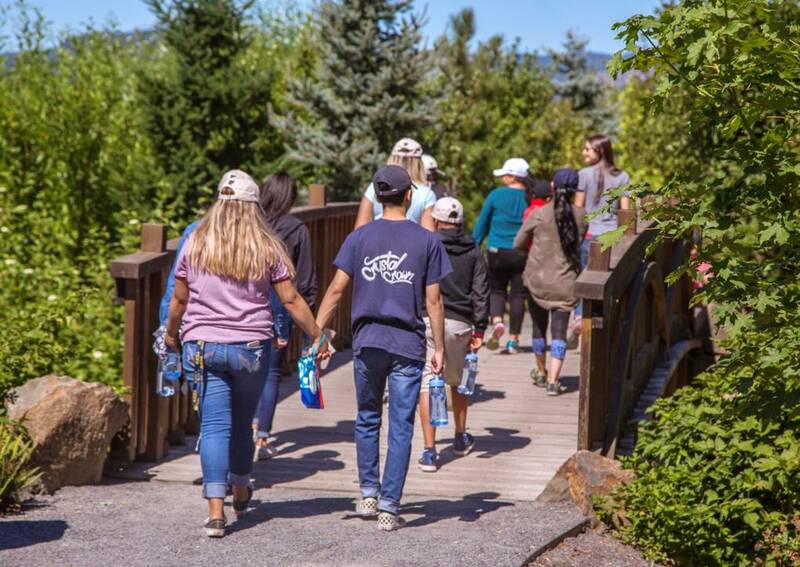 It was a revolutionary complement to the utility’s basic sewage processing mission, offering lush gardens, forested hiking trails, a visitor center, rental halls, a commercial kitchen and a salmon-bearing stream fed by treated wastewater. All of it is open to the public as a park and museum-like interpretive facility, designed from the start to share the gospel of wastewater management. The public facilities cost about $8 million, or less than 1 percent of the new treatment plant’s $1.8 billion cost. Both were completed in 2011. Brightwater is not the first or the only center of its kind in the West. A growing number of wastewater utilities are investing in public amenities in an effort to bring their work out of the shadows. They view it as a survival strategy: As recycled wastewater goes mainstream and decaying infrastructure demands expensive maintenance, they’ve decided Americans need to know more about what happens after they flush the toilet. And they’re finding out that people are interested. For decades, many wastewater treatment plants have offered guided tours for school classes and community groups. Some offer access by appointment to wetland habitats used for wastewater disposal. These new facilities are different. They have regular public hours during which visitors can drop in for an educational experience that may include hiking, picnicking or attending a special event. O’Connor’s agency invites people to visit its Fernhill Wetlands, a 700-acre park-like setting where wastewater is treated naturally in a complex of streams, ponds and wetlands before discharge to the Tualatin River. There’s a 1.5-mile trail network open to the public, with more trails in the works. The agency is also constructing a small education building, at a cost of $150,000, that will offer multimedia displays explaining the wastewater treatment process. One of the first wastewater utilities to embrace this new mission was the LOTT Clean Water Alliance in Olympia, Washington. The agency’s name is an acronym that stands for the communities it serves: the cities of Lacey, Olympia, Tumwater and Thurston County. 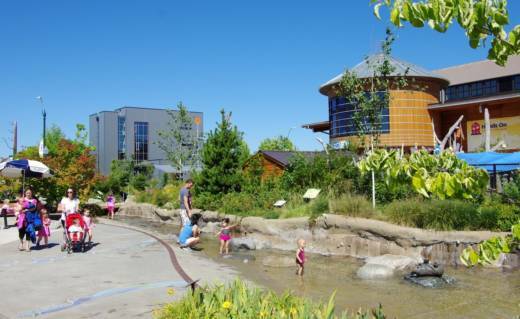 In 2010, it opened the Water Education and Technology (WET) Science Center, where interactive displays allow visitors to locate their own home in the sewage treatment network, then learn how their wastewater is cleaned and returned to the environment. Its most remarkable feature is the East Bay Public Plaza, a constructed stream and wetland that flow with recycled wastewater. Visitors are invited to wade in the stream. It has become a popular destination for families, especially on hot summer days. Signs and artwork in the plaza educate visitors about the importance of clean water and the wastewater treatment process. The plaza was built for $4 million in partnership with the city and port of Olympia. The WET Science Center draws about 17,000 visitors a year, Lind said. It was placed in the lobby of the agency’s new administration building, which carries a LEED Platinum certification, recognized as the highest achievement in sustainable design and construction. The building cost $13.5 million, and the WET Center accounted for about 10 percent of that. The visitor appeal is helped by the fact that the building and stream are located next door to the Hands On Children’s Museum, a nonprofit that promotes science and arts education. These facilities were all built in relatively affluent communities that already have other outstanding outdoor recreation available. But the newest in this genre is starting from a different place. Later this year, East Valley Water District in San Bernardino County, California, will start construction on its Sterling Natural Resource Center, a brand-new wastewater treatment plant. It will be built in the city of Highland, where the poverty rate is about 50 percent higher than the national average. Historically, utilities often built their wastewater treatment plants in poor neighborhoods or out-of-the-way places, because it was assumed the public didn’t want to think about sewage. Rather than repeat that practice, East Valley set out to design the new plant as an asset for the community, said John Mura, the district’s general manager and chief executive. He believes the $140 million investment in the treatment plant is buying not just a sewage processing factory, but a catalyst for community improvement. Among other things, he hopes the facility becomes popular for weddings and regular events, like a weekly farmers’ market. Indoor spaces will include a community center with meeting spaces available to rent, a catering kitchen and classrooms with computers and multimedia equipment. Rental fees for ratepayers will be nominal – just enough to cover custodial costs. Highland also has a shortage of public parks, and the new Sterling Natural Resource Center will help remedy that. The grounds will include an 8-acre public park, walking trails, an outdoor amphitheater and stage, native plant gardens and kiosks offering educational information about wastewater treatment. Sewage treatment plants are required to include detention basins to hold treated wastewater in the event of a power outage or other disruption. Often these are ugly, industrial things. At the Sterling Center, the detention basin will be built as a landscaped pond with picnic platforms and boardwalks built over the water. The project also represents a major step toward self-sufficiency for the community. Since its founding in 1954, the district has provided drinking water but not sewage treatment. Instead, it has conveyed raw wastewater to the city of San Bernardino, which does the treatment and disposal under contract. With the new Sterling Center, the district will begin treating its own wastewater. Instead of shipping it out of the community, the highly refined wastewater will be used to recharge groundwater, which provides about 75 percent of the community’s drinking water. The entire project is being built at no more expense to ratepayers than what they currently pay the city of San Bernardino for wastewater treatment, Mura said. No rate increases will be necessary. And by treating its own wastewater, the district will gain more control over future rate increases. The district also plans to use the facility to promote careers in water and wastewater management – a goal also cited by the other utilities interviewed here. The industry is graying, Mura said, with nearly half of current employees eligible for retirement within five years. At the Sterling Center, the East Valley Water District will partner with the local K-12 school district to launch a career training program. Students at Indian Springs High School – located across the street – will be able to take classes to qualify for state certification as water plant operators. The day they graduate from high school, they’ll be eligible for career-track jobs in the industry that come with health benefits, pensions and tuition assistance for a college degree. All these new programs and amenities – parks, meeting rooms, trails and classes – are expected to add only about 10 percent to the cost of the basic wastewater plant, Mura said.